Retreats, escape and where it all began. "Nature is man's teacher. She unfolds her treasure to his search, unseals his eye, illumes his mind, and purifies his heart; an influence breathes from all the sights and sounds of her existence." Alfred Billings Street. While reflecting on where this thirst for escape and solitude to nature's beauty began for myself and Tim, I realised it's always been entangled throughout the essence of who we are as a couple. Our first date (me at 17 years old) was spent climbing Slieve Donard mountain in Newcastle Co.Down and a picnic on a quiet deserted inlet of Murlough bay, of which we have since titled The Secret Beach. When other young adults were making plans for city breaks and nights out with friends, we were on the hunt for areas that had not yet been populated by the bustle of our enthusiastic peers. Perhaps it is our introverted nature that has left us always wanting peace and quiet. We both share the appreciation of being soulfully moved by the perfect panoramic view of a mountain range, or the endless horizon of an ocean meeting the sky. We love nothing more than to sit on an empty beach, quiet in our thoughts, and be completely present in those moments. These experiences are our idea of perfect rest from the intensities of life. 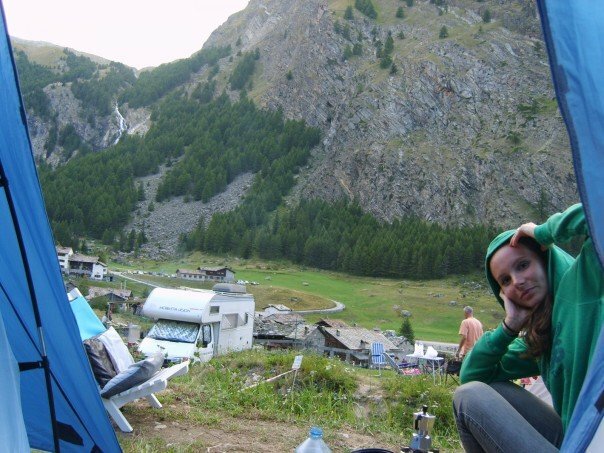 Honeymoon in Cogne, Italian Alpine range 2007. Not a Spa in sight! When travelling we have always appreciated good food and good service. I suppose if I'm honest we are not the easiest customers. I appreciate freshly prepared quality ingredients with attention to flavour and presentation. These are details that are important to me even when preparing a meal from my own kitchen. On many occasions I find that these components of good service are not always met by the provider, and it can have a disappointing effect on a greatly anticipated break away. Through our own explorations to find the perfect getaway or retreat, we realised there were limited options available for retreats within our own wee country that allowed for an extended time away from our busy lives. Travel further afield and the market is saturated with lots of different types of retreats but these are at times extremely over priced and not fully accessible for couples like Tim and I who like to do things on a budget. When birthing the idea of a Retreat business we knew the three most important components would need to be LOCATION, FOOD and HOSPITALITY. Does the location sell itself? Is there something wonderful to gaze upon while spending time detaching from the pressures of home life and all it's demands? Can we provide thoughtfully designed meals that provides our clients with a wholesome burst of flavours and interesting presentation, where our love for combining nutritious food with our love for creativity is embodied into an exciting menu? Would the client leave feeling like they can't wait to return? One of the most important parts of creating a restful atmosphere and one where people can feel open to be themselves, is conveying to the client the importance of their presence there. That they are immensely welcome, and their experience while with us is important to us. If we are successful in incorporating these things into a Freedom Retreat, then our clients are guaranteed a memorable experience. Tim and I are passionate about facilitating these potentially life changing opportunities for many of you. We have dreamt for many years of finding a way to incorporate the things we love into a project that will allow us to be enriched by experiencing it with others in such a wholesome way.